Subject: Your Visa Debit Gold Cards Number is: 4146650304178790. Western Union Money Transfer. Announced its decision to make an optional repayment of $100,000.00 to each debtor , an account has been opened in your name and the total moneykeyed in your Western Union Gold Card Rewards . 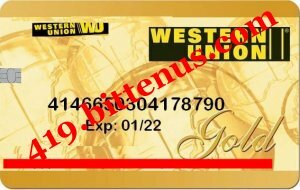 Your Western Union Gold Card can be used for cash withdrawals anywhere Visa debit cards are accepted3,000.00.per day ,even online transfe! or just hand it to theWestern Union Agentclerk to Withdraw cash. Your Card Number is: 4146650304178790 use it in the 1st time Signing in and clicks proceed to verify the transfer .In addition to the initial activation you will receive your PIN and your Western Union Gold Card when the following fees are paid. Receivers Name: KELVIN OGECHUKWU OMOKWE. Western UnionBENIN - COTONOU . Western Union Money Transfer. Announced its decision to make an optional repayment of $100,000.00 to each debtor , an account has been opened in your name and the total moneykeyed in your Western Union Gold Card Rewards.Your Western Union Gold Card can be used for cash withdrawals anywhere Visa debit cards are accepted3,000.00.per day ,even online transfe! or just hand it to theWestern Union Agentclerk to Withdraw cash. Subject: Your Visa Debit Gold Cards 4146650304178790. .